One day while walking down the street, a very successful Human Resource Manager (HR Manager) tragically hit by a bus and she died. Her soul arrived up in the heaven where she was met at the Pearly Gates by St. Peter himself. “No problem, just let me in”, said HR Manager happily. “Well, I would like to, but I have higher orders. What we’re going to do is, let you have a day in HELL and a day in HEAVEN and then you can choose whichever one you want to spend eternity in ” cleared St. Peters. “Actually, I think I have made up my mind and I will settle in Heaven only” said the HR Manager firmly, but just to get rejected. “No no, we have rules here. And as per the rules, you will have to do a day in Hell and Heaven respectively and then decide. You can not bypass the rules” said St. Peters. 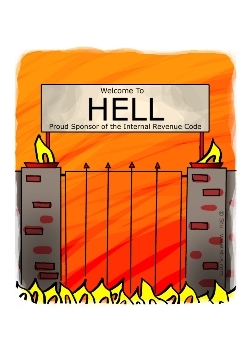 HR Manager had to agree to that and was escorted to an elevator which went down, down and down towards Hell. Door opened and she was mesmerized to see lush greenery every where and a golf course. She also saw a club and was happy like hell. There were many of her colleagues and people who worked for her. They were all dressed up like it was party of some sorts going down there. They all were happy to see the HR Manager in hell. They all hugged her and some kissed her hand to show the gratitude and happiness. The HR Manager was very happy to see such a welcome from them. There came Hell’s chief and asked her to come in hell and make herself comfortable. She enjoyed every minute of the day playing golf with her friends. In the evening, she boozed in the club like there was no tomorrow. But eventually the time slot made available to her came to an end and she was asked to travel back to heaven. She was not feeling like leaving hell, but rules oh rules. She again got into that elevator and the elevator went up, up and up to heaven. When the door opened to the heaven, she was walking on the clouds and fairies all surrounded her. All day long she was just singing and dancing with fairies. Time flew like wind and here she was again infront of St. Peters. “Well, now that you have lived both in Hell and Heaven, which one you choose?” asked St. Peters. “Well, to be frank, I enjoyed it here in Heaven but, I felt like spending my time more at the hell than in the heaven. So I will choose Hell over Heaven” said firmly the HR Manager. As per her choice, St. Peters again sent her to the hell. As the door of elevator opened, she found herself standing in a desolate wasteland covered in garbage and filth. She saw her friends were dressed in rags and were picking up the garbage and putting it in sacks. The devil came to her and put his arms around her. ” I don’t understand” stammered the woman, “yesterday I was here and there was a golf course and a country club and we ate lobsters, we danced and had a great time. Now all there is garbage and wasteland and all my friends look miserable”. The devil with a devilish smile explained to her, “yesterday we were recruiting you. Today you are an employee“. This is a corporate scene everywhere and this story was mailed to me by a friend of mine. Hope you all will like this story.